For over a thousand years, the Eight Dark Lords have terrorized the land of Morone. They dream of conquering the entire world, but for that they need to revive the Ninth Lord Magslayum, whose essence is trapped in a magical sword somewhere in the Corum province. They hire three Crayn magicians to retrieve it. However, the magicians plan to double-cross the Lords, and join forces with a mad sorcerer named Balos to find the powerful magic Jumarion and use it in an attempt to reclaim Morone for themselves. Meanwhile, a devastating decade-long war in the land of Lendore ended with a mysterious suicide of the king. A young warrior named Kaien leaves his father's home in search of adventure. He meets a mysterious little girl who is proclaimed cursed, and becomes inadvertently involved in grand schemes that cast their shadows over Corum. Corum III: Chaotic Magic is a sequel to Corum II: Dark Lord. It is set in the same world and features some recurrent characters. Like its predecessors in the Korean-made series, it is an action role-playing game in which the protagonist traverses interconnected hostile areas and visits towns to buy equipment and supplies. The player character can execute combo and dash attacks, and jump. Unlike the previous games, the player can switch between playable characters. Two other characters join Kaien over the course of the game. The spell system from the previous game is back with more variety and refinements, including different spell disciplines for the three characters (such as sword techniques, elemental summons, etc.). Spells increase in proficiency when used repeatedly. Characters also possess unique field abilities such as sliding, which allows access to optional and secret areas. Towns offer jobs and side-quests that reward the protagonists with money and experience. Also new to the series is a network version, which offers several arena modes and a dungeon rush mode. 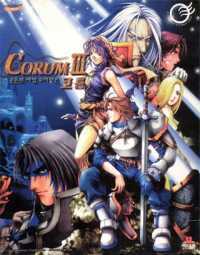 Altogether, Corum III may be the best single player action RPG ever developed in Korea, and it was a loss for Germany that this was passed for a localization in favor of its still rather unpolished predecessor. This time Japan got more lucky, as Bothtec provided a translated version over there. The most funny and at the same time most sad thing is, Corum III actually made it to the US, yet hardly anyone ever got to play it there as the localization was handled by Gobe Software, then publisher of BeOS. Thus the game was only available for that not exactly widespread operating system.